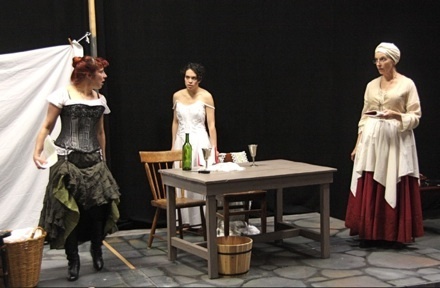 Paula Vogel's "Desdemona" - Performances This Weekend! 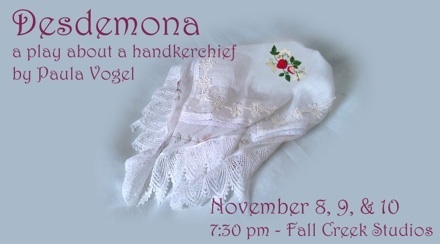 Fall Creek Studios, 1201 N. Tioga St.
Join us as we close out 2013 with a staged reading of Paula Vogel's Desdemona, A Play About A Handkerchief, November 8-10 at Fall Creek Studios. 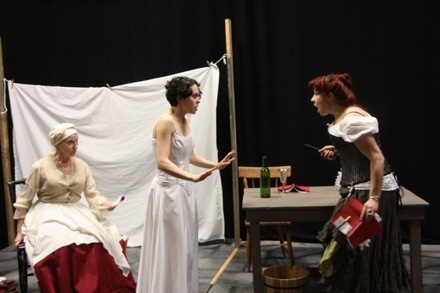 This modern re-vision of Othello takes the three female characters from Shakespeare's play and imagines their lives, personalities, and relationships very differently from the way they are presented in Shakespeare's play. Funny, provocative, and thought-provoking, the play blends humor and a critical examination of the treatment of women in Shakespeare's play into a unique and compelling theatrical experience. This all-female production is intended as a follow-up and companion piece to ISC's production of Othello this past summer. It features two members of the Othello cast reprising their roles: Marissa Biondolillo will again play Desdemona, while Judith Andrew returns as Emilia. The cast is rounded out by ISC founding member Melanie Uhlir as Bianca, and former Ithaca College faculty member Judith Pratt directs. Presented in a form much closer to a fully staged production than a concert reading, this show is full of bawdy humor and demands that each actress perform with a different accent! There will be a special talk about the play by playwright and theatre scholar Aoise Stratford on Sunday, November 10. Paula Vogel received her M.A. from Cornell University in 1976 and was awarded the Pulitzer Prize for drama in 1998. Desdemona premiered in 1979 and is structured in thirty "cinematic 'takes' " of varying length. It is not simply an expansion of Othello but a completely new play that draws on Shakespeare's characters to explore important issues of sexism, classism, and the way men and women relate both within and across lines of gender.